Hotel Melia Zanzibar, Kiwengwa, Tanzania - Lowest Rate Guaranteed! When you stay at Melia Zanzibar in Kiwengwa, you'll be on the beach, within a 5-minute drive of Mapenzi Beach and Kiwengwa Beach. 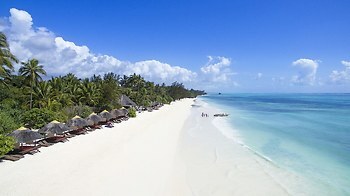 This 5-star hotel is 14.5 mi (23.4 km) from Mnemba Island and 21 mi (33.9 km) from Kendwa Beach.